For many years, Titanium Buff has been a staple color for artists and craftspeople alike. This related grey pigment offers the same versatility and richness as the popular Titanium Buff. Titanium Dioxide based and therefore endowed with good coverage and high tinting strength. This pigment is suitable for all binders, including fresco. This is an unusual pigment, a surprisingly neutral gray that is in the middle of the value scale when mixed with linseed oil. I compared its masstone to a midtone acrylic neutral gray and it matched closely. In a glaze or wipe technique, it is warmer. 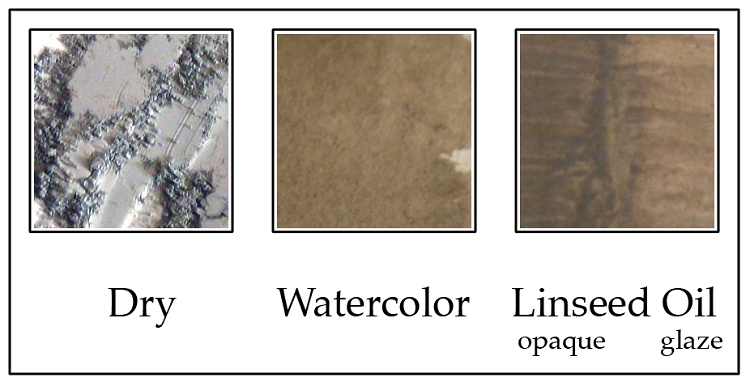 Besides general use, I plan to try it in high-key grey underpainting, and for toning canvas. Q: no questions? I want to write about this pigment. [I'm using it for home made oils]; so far it seems perfectly neutral,. I think its impossible to make a chromatic grey, it always wants to shift towards red, blue or yellow. Also combinations of white and black are always shades of blue to the point that our eyes [my eyes] are convinced that a black/white grey is the only true grey - whereas the titanium grey is perfectly neutral and stands alone in the middle of red, yellow and blue. A: Thank you for sharing your experience. A: Many of our customers call it the most neutral grey they have come across. If anything, it leans towards a tan cast, but not towards an orange shade. Q: Can this pigment be added to Encaustic Wax? A: Yes, this pigment can be used in encaustic and all other mediums, including fresco lime and cement.